Notes: This was a great knit. It's so easy to pick up whenever and wherever--watching TV, talking on the phone, waiting at the Starbucks drive-thru. Even though it's 1x1 rib, there is a sense of continual fascination to see how the colors unfold and play against each other, and I didn't really get bored. 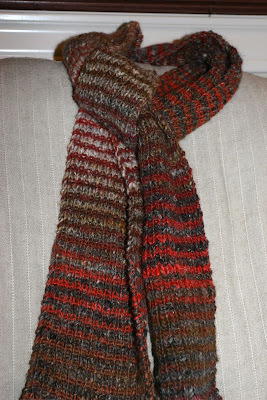 Oh, and I love that there is minimal finishing required--only a few loose ends to weave in and it looks fine without blocking. 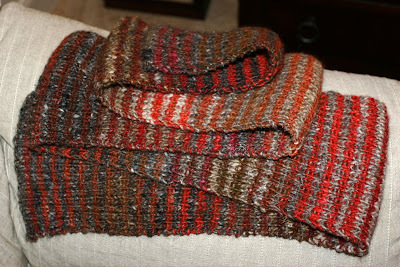 I ended up with a 5-1/2" x 72" scarf.